After Vienna and Prague, I ended my triptych of Central European capitals in Bratislava, Slovakia’s modest but lovely capital. With a population of “only” 415,000, Bratislava feels more like a town than a capital city, which in my opinion is a great thing. I found it had much more in common with Brno, Czechia, than with Prague. With a relatively small and with a laidback atmosphere (the crowds of Prague are just a fading memory), as well as a friendly young population, after just one day of sightseeing Angeliki and I already felt at home here. While less popular than those other European capitals, Bratislava is conveniently located where Slovakia, Czechia, Austria and Hungary converge, making the Slovakian capital an easy addition to any tour of Central Europe. The city limits of Bratislava actually border two countries: Austria lies on the west just across the Danube, while Hungary is only a short drive south. Given its location, the city’s multicultural history shouldn’t come as a surprise. 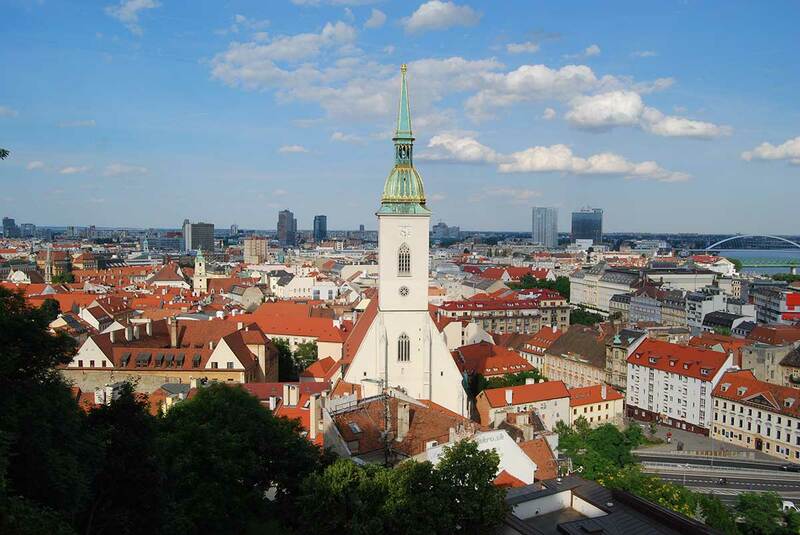 Inhabited already in 500 B.C., Bratislava predates supposedly more historical cities such as Prague and Budapest by several centuries. Over this long span of time, Celts, Romans, Magyars, Slavs, Germans, Austrians, Turks, Jews and Roma have all lived there and left their mark on the city. The Gothic Saint Martin’s Cathedral, a defining element of Bratislava’s Old Town. Bratislava lived its golden age as the coronation city of Hungarian kings between the 16th and 18th centuries, as Buda and a vast part of Hungary were occupied by the Turks. Most of the landmarks we see today date back to this period. Although present-day Bratislava’s population is largely Slovak, Germans and Hungarians used to be the majority ethnic groups until the end of the First World War, when most of them fled to Austria and Hungary. We found this captivating history palpable in the streets. The Old Town (Staré Mesto) is pretty and cosy, a cluster of meandering cobbled alleys filled with fine architecture, historic buildings, graceful churches, shops, pubs and restaurants. That said, speaking honestly, none of the landmarks are truly awe-inspiring. Take the pink Primate’s Palace with its elegant neoclassical facade surmounted with a frieze and statues; the Neo-Renaissance National Theatre; the stark Gothic silhouette of St. Martin’s Cathedral; the medieval Michael’s Gate, with its green copper roof: they aren’t the most impressive monuments in Europe, yet they have their little charm, and together form an undeniably pleasing picture. 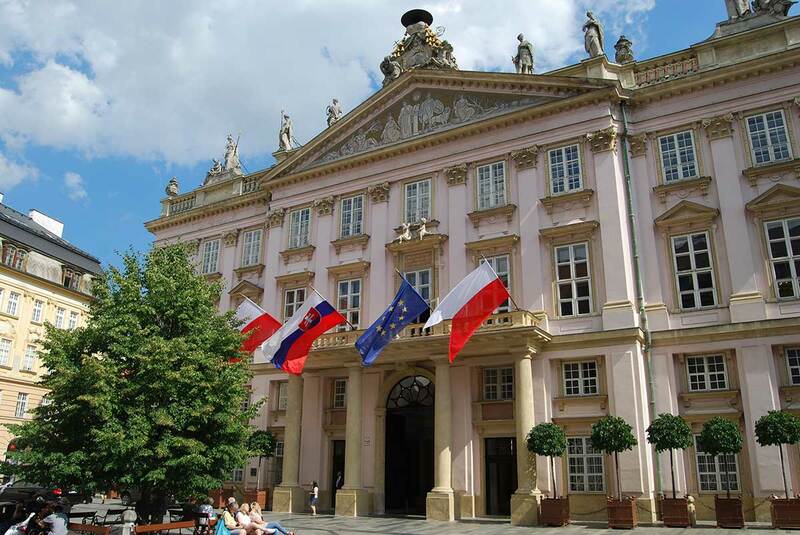 The neoclassical Primate’s Palace in Bratislava. Head to Hlavné námestie (“Main Square”) and you will get my point: a trapezoidal open space delimited on all sides by nice pastel-coloured mansions, a fine church and the charming old town hall all surround a beautiful fountain in the middle, as well as trees, benches, street artists, statues and a meagre crowd of tourists and passers-by. Nothing striking, just perfectly lovely. Speaking of which, you must absolutely check out the most wonderful building in Bratislava, the Church of St. Elisabeth, a few blocks from the old town. It’s a beautifully decorated art nouveau church that looks as if it were drawn from a fairy tale. After wandering for a couple of hours around the inner city, we headed to the castle. In times past, the castle used to be integral part of the old town, but today it is separated by a wide highway the Soviets built in the 1960s. 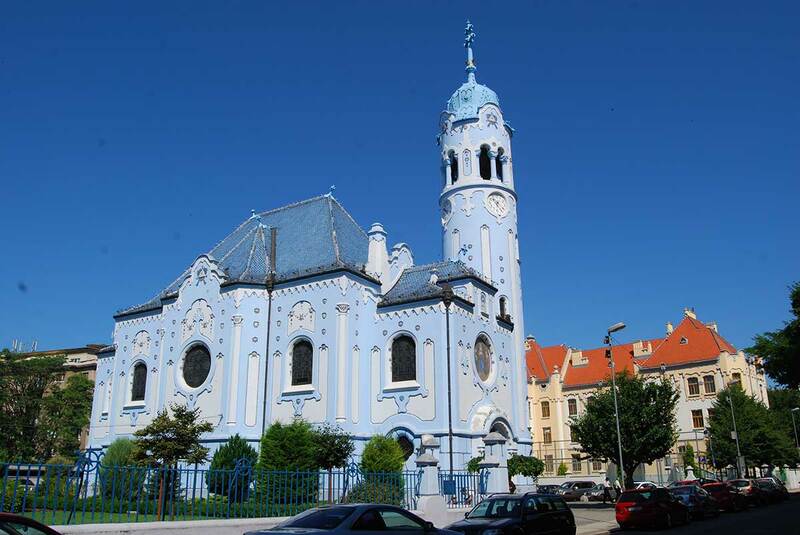 The Church of St. Elisabeth, one of the most delightful buildings in Bratislava. Unfortunately, a considerable part of the old town, including most of the Jewish district, were levelled by the Soviets’ building spree. The castle, too, was not spared by the tumultuous history of the city, having been razed to the ground and rebuilt several times. The current hulking rectangular white structure serves as a venue for the Slovak Parliament and houses collections of the Slovak National Museum. More attractive than the castle itself are the Baroque garden behind it and the green lawns covering the slopes of the hill, which make an ideal setting for a romantic stroll. 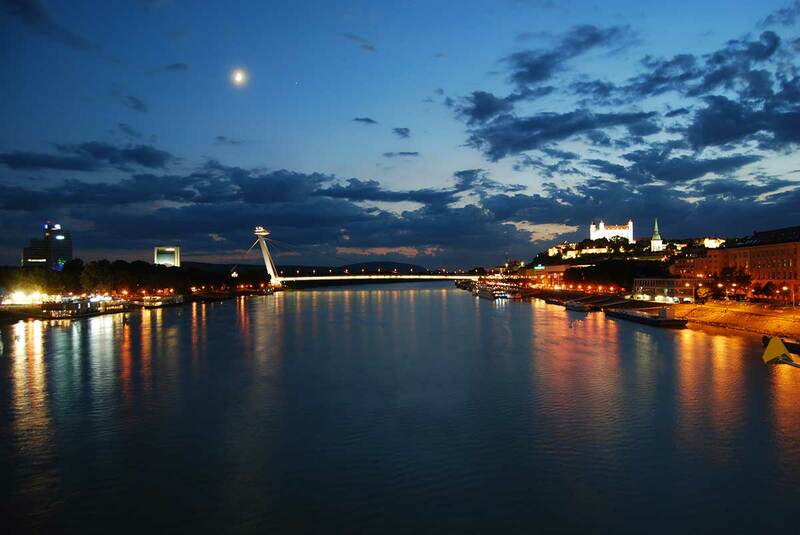 The best parts of the castle, however, are the stunning views over the Danube River and the city. From here you can enjoy the best perspective of the iconic SNP Bridge, nicknamed “UFO Bridge” because of the flying saucer–topped tower that hovers above the bridge and looks like it’s shooting lasers down below. A quiet street in Bratislava, where food is cheap and beer is cheaper. The Communist-era structures scattered around the city, although certainly not aesthetically appealing, constitute a very interesting feature of Bratislava. From the “Yard of Honor” in front of the castle, stretching endlessly across the river, you can see Petrzalka, the biggest concrete block housing complex in Central Europe, where 150,000 people live. Another Communist landmark is the Slavín Memorial, a massive obelisk and war cemetery commemorating the almost 7,000 Soviet soldiers who lost their lives in the liberation of Bratislava during World War II. The monument sits atop a hill a bit out of the city center, but it is still reachable by bus. 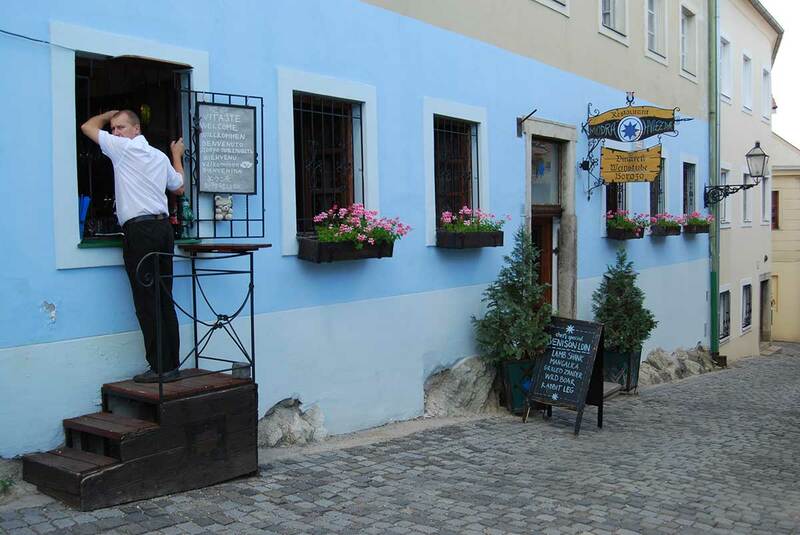 Being off the beaten path, Bratislava is a wonderful city just to wander around and relax in. It is easy walkable, and free of heavy traffic, annoying crowds and tourist traps. There are plenty of nice coffee shops, restaurants and bars to enjoy good food, wine and beer at ridiculously low prices (a pint of beer or a glass of wine for about €1!). And if you’re so inclined, I recommend visiting some of the excellent microbreweries in town. When I sat down at Zámocký Pivovar, on the way to the castle from the old town, I was shocked to be tasting some of the best beers I’ve had in my life—better than those in Czechia, Austria and Hungary. While not the greatest claim in the world, it’s proof that Bratislava, like Slovakia at large, is best enjoyed in the modest, little moments.